A water company has been fined £500,000 after thousands of gallons of raw sewage flooded a park in Birmingham. Severn Trent Water said it was "truly sorry" for the spillage in Sutton Park, Sutton Coldfield in November 2013. 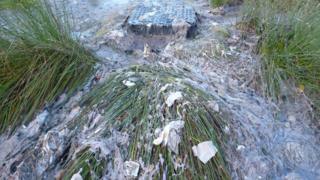 The sewage spewed from a manhole cover after a sewer blockage, and covered about 1.15 ha of the park. The spot is a designated Site of Special Scientific Interest (SSSI) and rare plants had to be destroyed to avoid contamination. At Birmingham Crown Court on Friday, the accident was found not to be commercially motivated and Severn Trent was said to have made the necessary steps to remedy the situation. However the clear-up, which involved scraping soil and plants from the affected area, was found to be slow and poorly managed. The spillage itself was said to be "amongst the worst damage to a SSSI that Natural England have witnessed," according to the government body's regional manager, Emma Johnson. As well as spreading across the park, sewage also entered a ditch and flowed into the Longmoor Brook, ending up in Longmoor Pool within the park. Ms Johnson said she hoped the prosecution would "highlight the importance of protected sites and the need to look out for them". The water company said it had worked hard to improve its environmental performance and as a result had "significantly reduced the number of pollution incidents" it was responsible for. A spokesperson for the company also said it had invested millions of pounds to prevent sewer blockages. In addition to the fine, Severn Trent was also ordered to pay legal costs of more than £50,000 and a victim surcharge of £120.